This chunky, bright watch has been especially designed to appeal to children and it does much more than just tell the time. 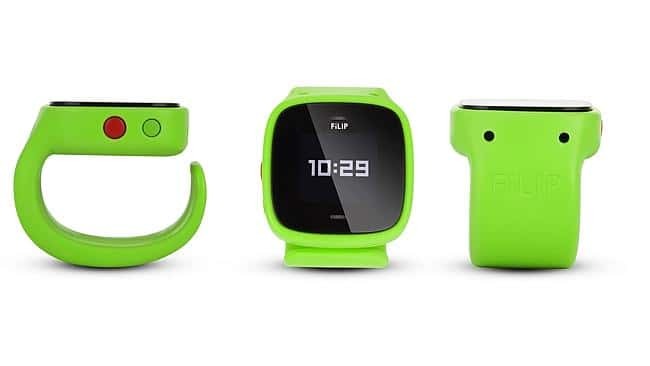 FiLIP features voice and location technology, it is essentially a wearable, smart locater that is designed to help keep the wearer safe and put parents minds at ease. It uses WI-FI triangulation, mobile phone tower location and GPS to allow parents the ability to see their childs exact location. It works in conjunction with a smartphones and parents can even set a 'safe zone' perimeter so that they can be notified if their child leaves a specified area. The FiLIP watch can receive text messages and phone calls from preprogrammed authorised numbers. Up to five numbers can be programmed into the device and it features two buttons that allow children to contact parents. When the emergency button is pressed the Smartwatch will call the first number on the built in list of phone numbers. If there is no answer it will call the other four phone numbers. When the emergency button is pressed the device will record any sounds around the device and send a notification with the childs location to the parent. It is simple to use in an emergency and much less complicated than a smartphone.